A fishing vessel was attacked by 2 skiffs in vicinity 04-59N 058-00E at 030532Z OCT 11. ***This vessel managed to evade hijack*** ***Vessel is SAFE*** The Pirate Attack Group is still in the area. Alert 222 / 2011 02/10/2011 04:25 0355N 05620E Attacked At 0403 UTC / 02 OCT 11 / a merchant vessel has been attacked by skiff in position 03 55 N 056 20 E.
Experience has shown that to transit W of 60E significantly increases the risk of piracy, although attacks have and will occur E of this area. 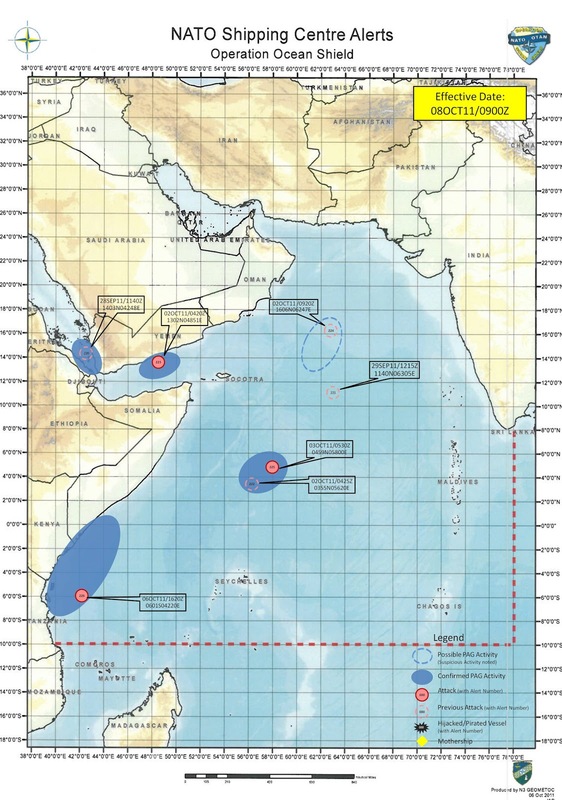 MSCHOA advises all vessels navigating in the Indian Ocean to consider keeping East of 60E when routing North/South and to consider routing East of 60E and South of 10S when proceeding to and from ports in South Africa, Tanzania and Kenya. Vessels should report to UKMTO Dubai *** on entering the UKMTO Voluntary Reporting Area (VRA) bound by Suez,78E and 10S. 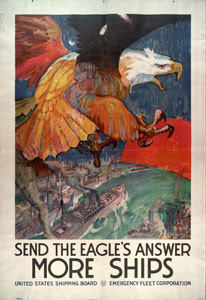 Thereafter vessels should report their position, course and speed daily. Upon receiving the vessels initial report, UKMTO will reply giving specific threat guidance relevant at the time. Alert number 223 / 2011 02/10/2011 04:20 1302N 04851E Attacked At 0410Z UTC / 02 OCT / a merchant vessel was attacked by pirates in position 13 02 N 048 51 E.
Now, as set out in Where the Somali Pirates Operate and Why, we can safely assume the pirates are aware of the more heavily traveled "sea lanes" or shipping routes that ships use to transit the Indian Ocean and will send out PAGs to allow interdiction of unwary, underprepared, low in the water and slow speed ships traveling those lanes. You would expect then, that the pirates might have 4 or 5 areas where they would find the "hunting" particularly good. 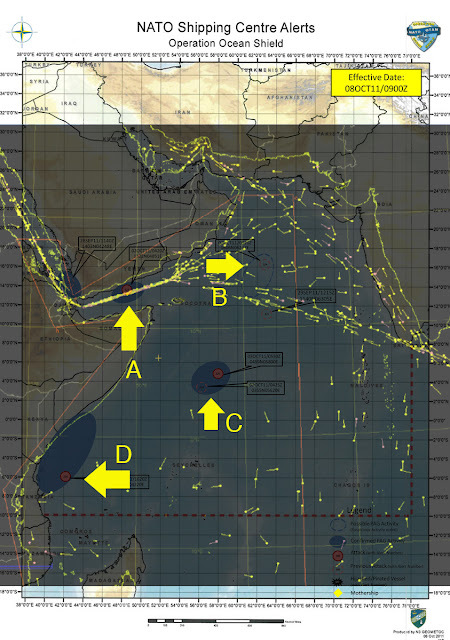 And, if you overlay 2010 shipping info over the current NATO activity map, as I have done nearby, you see that the early PAGs are setting up at areas where the shipping is including a rich area (area marked "B" on my map) where shipping in and out of the Arabian Gulf is "choked" into a small area by the Strait of Hormuz. Similarly, Area "A" is traffic "choked" by the narrow Bab el Mandab entrance/exit from the Red Sea, Area "C" is a catch point for traffic diverting to east on Madagascar, and Area "D" covers the coastwise chokepoint of entry into Kenya, Tanzania and the Madagascar Channel. Exactly where you would expect smart pirates to be. Somali pirates, persistent little guys. . .